Federal safety regulators today proposed new connected-car technology that would enable cars and trucks to "talk" to each other in an attempt to reduce accidents and help traffic move more smoothly. In February 2014, Foxx directed the National Highway Traffic Safety Administration (NHTSA) to begin work on the rulemaking. Also under development is technology that will let vehicles communicate with "infrastructure," including such things as traffic lights, stop signs, and work zones. The Federal Highway Administration is working on those plans, dubbed vehicle-to-infrastructure (V2I). NHTSA estimates that safety applications enabled by V2V and V2I could eliminate or reduce the severity of up to 80 percent of non-impaired crashes, including crashes at intersections or while changing lanes. Data from cars and infrastructure would be updated and broadcast up to 10 times per second to nearby vehicles, and using that information, V2V-equipped vehicles can identify risks and provide warnings to drivers to avoid imminent crashes. 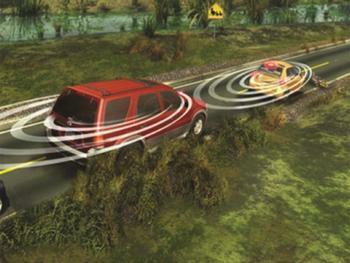 Vehicles that contain automated driving functions—such as automatic emergency braking and adaptive cruise control—could also benefit from the use of V2V data to better avoid or reduce the consequences of crashes, theory has it. Privacy would be protected since V2V does not involved the exchange of information linked to an individual, NHTSA said.